Benahavis has a total surface of 145 km2 and lies between Marbella and Estepona on the Costa del sol. It has 5.000 plus inhabitants. Benahavis municipality border does almost reach the coast but has not a coastline itself and starts in the South where the Community borders the line between Marbella and Estepona and reaches far inland up to the mountain range of the natural park Sierra de las Nieves. The village itself is located at 7 km from the coast in mountain surroundings at 150 metres above the sea level. The last miles towards it goes through a narrow gorge. In this gorge you can admire the strength of nature phenomenon’s . The river has made his way through the narrow rocks and made natural big jacuzzis (“charcas”). Benahavis is a little village that mainly has 2 main streets, but it is famous in Spain for its typical Spanish good restaurants and tapas bars. It has good sport-facilities and a few hotels and a 4star luxury spa hotel, and therefore often like in Marbella they are fully booked when European football teams have their winter season. We find it a shame that some newly built construction was done on the outskirts of the village itself. Benahavis is also renowned for being “the richest village in Spain”. That could be in fact the truth as it is bordering Marbella and you can not notice a clear difference between their urbanisations. For this reason the real estate located within its borders is considered as part of the Marbella area. So are i.e. the most exclusive golf & country club of Europe “La Zagaleta” and some luxury urbanisations and Golf Resorts such as “El Madroñal”, “La Quinta”, “Los Flamingos, “Marbella Club Golf Resort”, “Golf Monte Mayor” and “Los Arqueros” located in Benahavis. Benahavis has many renowned golf courses, such as: “La Quinta Golf”, "Los Arqueros Golf”, "Los Flamingos Golf”, "La Zagaleta golf”, “Montemayor Golf" and "Marbella Club golf”. 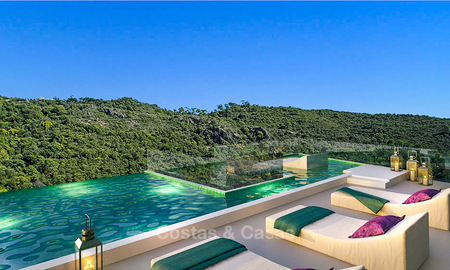 Costas & Casas has access to virtually all luxury properties, exclusive villas and quality apartments for sale in Benahavis.